J Ball Electronics ECM Tuning and Diagnostic Tools for On and Off-Highway Trucks and Equipment. 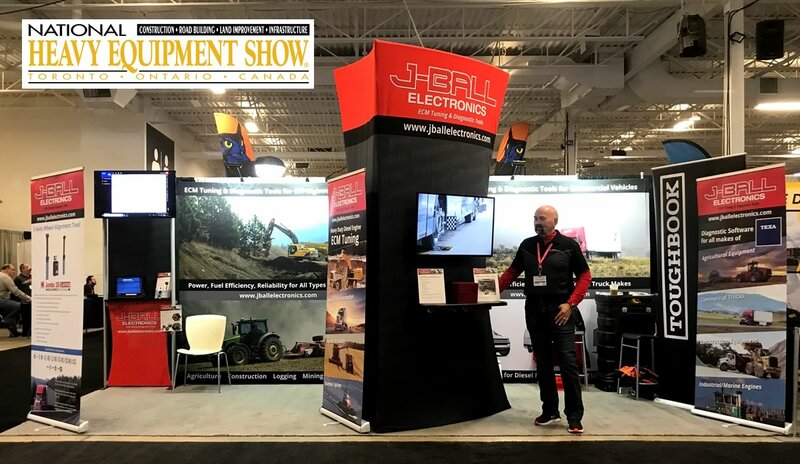 Hundreds of show goers stopped by the J-Ball Electronics booth at NHES to find out more about ECM Tuning, wheel alignment tools and to try TEXA Diagnostic Software. It was great to meet so many customers in person after having spoken by phone over the years. The draw prize winner for the 12″ rugged Windows tablet was Jason from Perth, ON. We look forward to meeting more customers at the upcoming APNA Truck Show in Abbotsford, BC in June. J-Ball Electronics is a leader in the ECM Tuning and Diesel Diagnostic Scanner and Tool industry with over 45 years in the trucking business. Call our knowledgeable technical staff toll-free at 1-855-326-8863 for more information. We're open from 6:00am-4:30pm Pacific (9:00am-7:30pm Eastern) to serve you Monday to Friday. Call us Toll Free 1-855-ECM-TUNE (1-855-326-8863) or click here to use our Online Contact Form. Receive ECM Tuning and Diagnostic Tool News & Updates in your Inbox. Disclaimer: J-Ball Electronics is in no way affiliated with or attempting to represent Caterpillar, Cummins, Detroit Diesel, Volvo, International or Mack. We are an aftermarket custom ECM tuner and rebuilder, all aforementioned names, logos and trademarks shown on our website are owned by the respective companies. © 2019 J Ball Electronics. All Rights Reserved.